ORLANDO, FL (October 5, 2018) – Today, Correct Craft and its manufacturing companies across the country participated in Manufacturing Day by hosting students at its factories. Five Correct Craft plants from Florida to California invited students to learn about both boat manufacturing processes and job opportunities in marine manufacturing. Correct Craft companies also gave the students plant tours. Centurion and Supreme Boats partnered with the Merced County Office of Education who brought local high school students to the factory. The Centurion and Supreme teams provided the students an opportunity to see first-hand how boats are built and see the great jobs that exist in manufacturing. Bass Cat and Yar-Craft Boats partnered with local schools and hosted students at their factory for a comprehensive tour and informed them about careers in marine manufacturing. 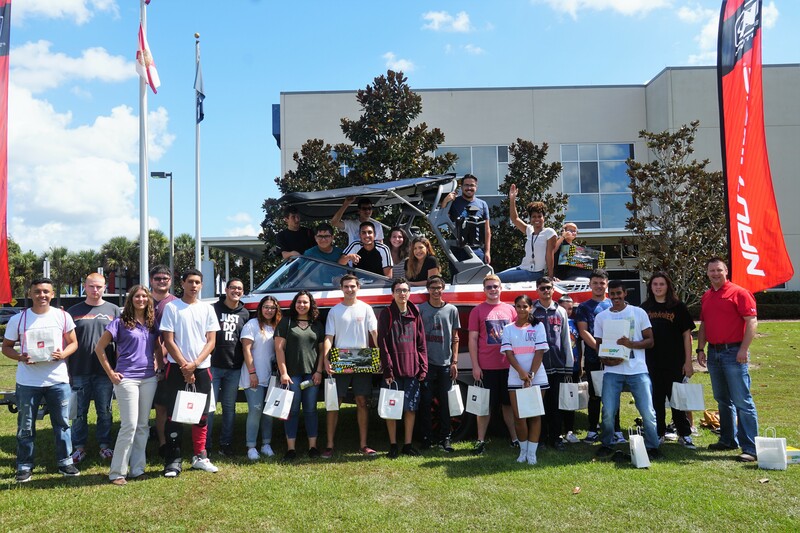 Nautique Boats partnered with the Manufacturers Association of Central Florida to bring Lake Nona High School students to the state-of-the-art Nautique factory for an in-depth tour and presentation. Pleasurecraft Engine Group (PEG) partnered with the Lexington Richland 5 Center for Advanced Technical Studies (MEBA) who brought students to the factory for a detailed tour of machining, production, and to learn more about careers in engine manufacturing. PEG will host additional students from the Newberry Country Career Center next week. SeaArk Boats partnered with local high schools and invited students in the agriculture/trade programs to the SeaArk factory for a thorough tour of their facility. Students learned how SeaArk boats are built and heard about the variety of careers available at SeaArk after they graduate.